Writing your first business plan? Be sure to review these four business plan examples from the Startups community that really stand out from the crowd. Founders have to learn so many new skills when they’re launching a startup, and writing a business plan is a big one. When you’re writing your business plan for the first time, things can get… intimidating. What do you include? What kind of wording should you use? What do make sure not to include? It’s enough to make even a stalwart startup founder throw in the towel before they’ve even begun. But, while it’s nice to be guided step-by-step, it can also really help to have concrete examples when you’re approaching creating something for the first time. So, with that in mind, here are four sample business plans from the Startups community that we think really stand out from the crowd. Click on the below links to see fully formatted versions or continue reading for the text-only version of Culina’s. Target Audience: Homeowners; property managers; insurance providers. Culina is a San Francisco-based IoT and home automation company. We design an advanced smart hub technology that enables users to interconnect and remotely monitor all of their cooking devices and kitchen appliances through a single user-friendly platform. To make homes smarter, more connected, and safer for families while helping them save money and conserve energy through the power of affordable, automated technology. To become the leading provider of IoT technology for kitchen appliances on a global scale with application across both residential and commercial properties. Culina Tech is the next leading name in home automation and IoT. We’re committed to leading the charge in creating the ultimate smart kitchen for homeowners all around the world. Our revolutionary Smart Plugs enable users to make any kitchen appliance or cooking device intelligent. Compatible with all existing brands that plug into standard two or three-prong wall outlets, Culina creates an entire network of Wi-Fi-connected kitchen devices. The Culina App allows users to remotely monitor the status of and control all devices connected to our Smart Plugs. Whether it’s remotely turning on the coffee pot after getting out of bed, turning off the stove if it was accidentally left on via smartphone, or switching on the crockpot before getting home from work, Culina is purpose-built to deliver unrivaled convenience and peace of mind. With the ability to set energy usage caps on a daily, weekly or monthly basis, Culina helps homeowners stay within their monthly utility budget and save energy in the kitchen through more efficient use of the dishwasher, refrigerator, freezer, stove, and other common appliances. When a device reaches its energy limit, Culina alerts users through their smartphone and is built with the ability to power down the device automatically if the user chooses. The App measures key usage metrics in real time, allowing users to get an instant dashboard view of energy consumption as it occurs. Our team has already finished the product development and design phase, with 3 prototype iterations completed, and we are now ready to begin mass manufacturing. We’ve also gained major traction among consumers and investors alike, with 10,000 pre-ordered units sold and $5 million in capital secured to date. With this round of funding, our objective is to ramp up hardware manufacturing, improve software UX and UI, expand our sales and marketing efforts, and fulfill pre-orders in time for the 2017 holiday season. We are currently seeking a $15M Series B capital investment that will give us the financial flexibility to achieve these goals. On behalf the entire Culina Tech team, we’d like to thank you for your time and interest in our company and this investment opportunity. With decades in the industrial design space, Kent knew he had the knowledge and the industry contacts to set out to improve upon home automation devices for the kitchen with a solution that not only made homes safer, but also cut down on energy consumption and the associated costs. In early 2013, Culina was born. Since that time, Kent and the Culina team have made it their mission to completely revolutionize the home automation and IoT space with innovative, AI-powered technology. Kent is a Carnegie Mellon graduate with over 10 years of executive leadership experience in industrial design and engineering. He has a successful entrepreneurial history, founding a prior tech-based startup which he grew to $100 million in revenue, followed by acquisition in 2010 and then IPO shortly after. Sherri earned her MBA from Harvard Business School. She oversees all of Culina’s ongoing operations and procedures and is responsible for driving Culina to achieve and surpass sales, profitability, cash flow, and business goals and objectives. Martin is a Stanford University alumnus with extensive technical expertise and over a decade of experience at venture-backed tech companies. He is responsible for Culina’s technical vision, heading up all aspects of our technological development, strategic direction, development, and future growth. Margaret earned her degree in Financial Management from NYU. Prior to joining Culina, Margaret spent seven years as CFO for a publicly-traded mobile tech company headquartered in Silicon Valley. She currently manages Culina’s financial risks and handles all financial planning, record-keeping, and reporting. An enormous need exists for dramatic reductions in energy consumption. Businesses alone consume 12-20% of the total US energy supply on food production, processing, manufacturing, distribution, and preparation. The majority of US households now spend roughly 35 percent of their energy consumption on appliances, electronics, and lighting. Most homeowners don’t think about the little details that can help save them money on their energy bill. The vast majority of people keep the refrigerator or freezer too cold, fail to make sure refrigerator door seals are airtight, neglect to regularly defrost fridges and freezers, overload their dishwashers, and keep dishwasher water temperature too hot. As a result, energy consumption remains high, and energy bills remain high. Not only do kitchens represent a primary source of the household energy consumption, but also a primary source of house fires. More fires start in the kitchen than any other room in the home, and household cooking appliances frequently account for the billions of dollars in fire-related insurance claims every year. The number one cause of house fires and house fire injuries is the stove. real-time insight into their energy consumption by aggregating data for all kitchen appliances connected to our Smart Plugs while also delivering the preventative intelligence necessary to reduce kitchen-related disasters. We designed our Culina Smart Plugs to work in tandem with an intuitive, user-friendly mobile application — allowing users to gain a much-needed technological upgrade to the most popular room in the house. Culina Smart Plugs work with standard two and three-pronged appliances and cooking devices. Simply attach the Culina Smart Plug to the appliance’s electrical, plug it into the wall, download the Culina app, connect, and configure. Powered by machine learning artificial intelligence, our Intelligent Culina Response System learns user habits every time someone uses an appliance connected to one of our Smart Plugs. Our state-of-the-art sensors detect a variety of potential threats to the kitchen — including sudden and unusual temperature fluctuations, poisonous gas and emissions, toxic smoke, and more. Homeowners receive alerts whenever unusual activity is in progress such as a stovetop being left on for too long or during an unusual time of day. Users can monitor all information directly from an easy-to-navigate dashboard in real time using the Culina App for iOS and Android. Users can check metrics such as fridge and freezer temperature, cook time, and usage data as it is being gathered. With the Culina App, users can control all connected appliances and devices. If our Smart Plug is attached to a crockpot, for example, a user can add the ingredients before they head to work, activate the crockpot remotely, and come home to a readymade meal waiting for them the moment they step through the front door. Not only does remote operation over appliances provide convenience, it also serves to prevent kitchen-related hazards. The Culina App includes auto shut-off capabilities allowing users to turn off appliances using their smartphone even when they’re not at home. This is particularly useful in the event that users forget to turn off the oven or stove to prevent potential house fires. In addition to notifying users if an appliance is left on by accident or if it detects a potential hazard, Culina also reminds users anytime regular maintenance is required. Users can also monitor energy consumption on a weekly basis right from the Culina App. By providing at-a-glance insight into whether energy use has gone up or down, users gain the ability to adjust their usage accordingly in order to conserve energy and ultimately save money in utility bills the long term. Our cloud-based technology integrates with other popular platforms including Google’s Nest and Lowe’s Iris. Not only can users conserve money in energy consumption bills with Culina, but new insurance guidelines also provide significant discounts for homeowners who deploy smart technologies in their homes. 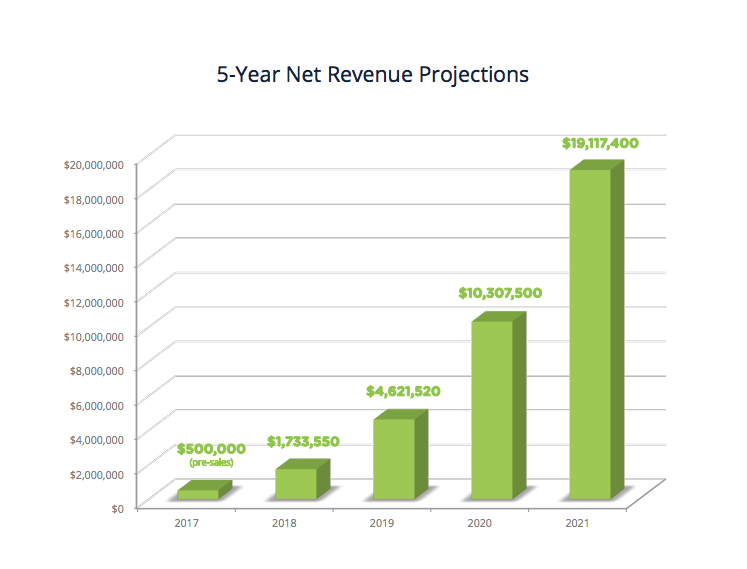 Culina will initially monetize from hardware sales. Our product will sell for $149 MSRP with approximately 40% profit margin. We will initially sell our product through popular e-commerce platforms and through our website — followed by brick-and-mortar outlets including Lowe’s, Best Buy, Home Depot, and other major big box retailers. With much of the heavy lifting already completed, Culina has laid the groundwork for rapid expansion going forward. Here’s an overview of our accomplishments since first founding the company in 2013. Our first generation product is market-ready and primed for commercial manufacturing. We have pre-sold 10,000 units, representing approximately $1,890,000 in pre-launch revenue. Our immediate customer base growing by the day and we have successfully proven that this is a product that consumers want and are enthusiastic about. We have secured a total of $5 million in funding among angel investors, founder capital, friends and family, and VCs. We have applied for and have been granted a provisional patent for our Smart Plug technology. We are in the process of building relationships with notable industry leaders, influencers, and development teams in the home automation sector. We are also in advanced-stage partnership discussions with a number of major name insurance providers. Culina has received coverage in many of today’s most renowned tech and entrepreneurial publications, including The Wall Street Journal, The Huffington Post, TechCrunch, The Verge, WIRED, and Engadget, among others. A US-based contract manufacturer has been secured and is ready to begin production with the capacity to produce around 50K units per month as we scale. Our initial focus on the consumer space with our launch product is just the first step in our long term roadmap to growth. In order to capture a larger market share and continue scaling the company exponentially, we are planning on rolling out a B2B model in the future. This will provide Culina with new revenue streams and will offer a valuable, tech-driven solution for businesses. Commercial kitchens consume a huge amount of energy — roughly 2.5 times more per square foot than any other commercial space, according to the EPA. The Foodservice Consultants Society International (FCSI) estimates commercial kitchen equipment is often only 50% efficient. The challenge with reducing energy consumption in commercial kitchens is that it’s neither practical nor affordable to replace all kitchen equipment or redesign entire work spaces. In an effort to reduce CO2 emissions, some governments are offering incentives to business who can cut back on their carbon footprint. In the UK, Enhanced Capital Allowances allow businesses to benefit from 100% tax relief on their qualifying capital expenditure on energy-saving equipment. This can provide a cash flow boost and an incentive to invest in energy-saving equipment which normally carries a price premium compared to less efficient alternatives. Our 2nd generation product will represent a revenue-generating and energy-saving solution for commercial kitchens where equipment is frequently selected based on low capital cost with little regard to whole life-cycle cost and the resulting negative energy consumption. Built on cloud computing, machine-to-machine communication, and information-gathering sensors, the Internet of Things market is rapidly making more and more commonplace devices “smarter.” Factor in the increasing prevalence of smartphones and tablets, and home automation and IoT products are now becoming much easier to use and significantly more affordable than they have ever been before. What was once only reserved for the wealthy and tech-savvy, everyday consumers now have direct access to and can take advantage of a growing number of home automation devices. The evolution of the Internet of Things has enabled consumers to digitally connect and remotely control everything from their door locks to their thermostat to their garage opener and essentially everything else in between. 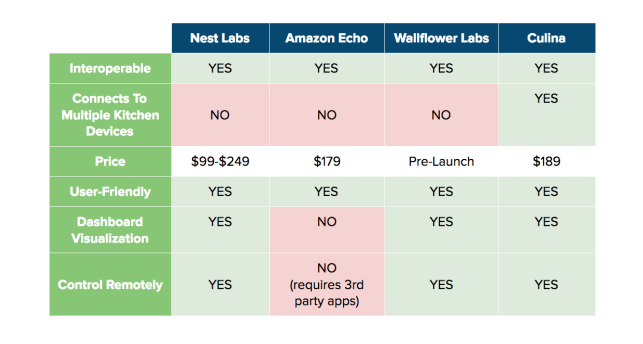 Evidence of the enormous impact home automation tech has had in the consumer space can be seen in the enormous adoption of products like Nest and Amazon Echo. The home automation market and Internet of Things (IoT) space is a thriving industry with growth expected to exceed $50 billion by 2020. This represents an estimated 300% increase from today’s market of $12.5 billion. Around 8.4 billion connected devices will be installed globally by the end of 2017, representing a +31% increase in just one year. Around 63% of these devices will be used by consumers, with the remainder deployed by businesses. Culina is perfectly positioned to capitalize on a major multi-billion dollar market opportunity to provide greater protection, actionable intelligence, lower energy consumption, and more cost savings to the millions of homes in the US. Homeowners are our end users and will benefit the most from our product. For homeowners, Culina represents safety, peace of mind, increased convenience, and an economically-wise investment that pays for itself over time. Including apartment complex and student housing owners. Culina offers increased owner ROI, occupant satisfaction, significantly lower operational and maintenance costs. By reducing home fires caused by unattended cooking and the resulting billions of dollars in related insurance claims filed every year. Insurance companies can also leverage our technology to adjust homeowners insurance policy pricing. Culina has carefully developed a diverse marketing plan intended to keep our brand in the hearts and minds of our existing and prospective customers, enabling us to continue expanding our reach, and grow our business. Between our massive social network followings and email database contacts, we regularly communicate directly with over 100,000 consumers. We will drive traffic and conversions to our website using social media marketing via Facebook, LinkedIn, Twitter, Instagram, Snapchat, YouTube, and others. We are also exploring SEO and SEM. We consistently release marketing content through our blog that aims to educate our audience about the value that our product provides. Our content marketing efforts aim to influence and persuade readers without having to rely solely on conventional direct selling tactics. We will launch an initiative to guest blog articles and features in IoT, home automation, and startup tech publications like TechCrunch, Wired, VentureBeat, and other outlets in our industry. Primary competitors for Culina include other companies that are currently operating in the home automation and Internet of Things space, such as Nest Labs, Amazon Echo, and Wallflower Labs. Leading home automation company Nest introduced their first product, Nest Learning Thermostat, in 2011. The company was founded in 2010 by former Apple engineers Tony Fadell and Matt Rogers and is headquartered in Palo Alto, California. Nest was acquired by Google on January 14, 2014 by Google for $3.2 billion and still operates under its own brand identity. Nest Labs designs programmable, self-learning, sensor-driven, Wi-Fi-enabled thermostats, smoke detectors, and other security systems. The 3rd generation Nest Thermostat prices at $249; Nest Indoor and Outdoor Cams are $199; and their Smoke & CO Alarm retails for $99. After Nest’s acquisition, the company has underperformed in sales and fallen below the expectations that Google set for them when it purchased the startup. Amazon Echo, also known as Alexa, is a voice command device powered by artificial intelligence and designed by mega online retailer Amazon.com. The smart home hub was initially released November 2014. Alexa is a voice-activated virtual assistant housed within the Echo smart speaker. Users simply say her name and then ask a question or give a command. The Amazon Echo retails for $99 for Amazon Prime members and $170 for everyone else. However, some users have noted uneven sound quality and limited “skills” capabilities. Users can also only interact and communicate with Alexa in English and German. Founded December 1, 2013, Wallflower Labs is a Charleston, MA-based startup that designs an internet- connected smart plug that works with any freestanding plug-in electric stove. The company’s founder previously founded Yap — a speech recognition technology that was acquired by Amazon in 2011 to help develop Alexa. The startup has raised a total of $2.5 million from three rounds of equity funding to date, with the most recent funding reported at $1.5 million via convertible note on August 30, 2016. The smart plug sounds an alarm and alerts homeowners via smartphone when the stove is turned on, someone forgets to turn it off, when a cooking time expires, or the smoke alarm activates. Because Wallflower Labs are still in the pre-launch phase, the company has not yet publicly released consumer pricing information. Unlike Culina, which connects with all smart appliances and cooking devices in the kitchen, Wallflower Labs is solely focused on monitoring stove usage. Culina makes it possible to gain an across-the-board view from an entire network of interconnected devices. Whether they’re connected to the refrigerator, a gas or electric-powered stove, a microwave, or dishwasher, our Smart Plugs can deliver insight into everything from smoke and gas detection, temperature changes, and usage metrics — regardless of the brand and through a single, user-friendly app. Our technology is easy to use and doesn’t require any technical-savvy. Setup and configuration is simple, users are able to be up and running out of the box in approximately 10 minutes, and software updates are deployed over-the-air. Culina is priced below our competitors’ products while delivering superior functionality and value. This will be an essential factor in helping us continue to gain market share nationally. Team Strength Our team is comprised of industry veterans who bring decades of experience to the table across industrial design, mobile tech, cloud-based technology, artificial intelligence, and more. Our leadership team has a history starting and leading companies to successful exits and have established valuable relationships with industry leaders along the way that will help the us strategically position Culina as a market innovator in the days ahead. Culina is currently seeking a total of $15M in Series B equity financing to fuel the next stage of company growth — including manufacturing, pre-order fulfillment, ongoing development of our platform, and marketing efforts in order to continue expanding the Culina brand. Any remaining funds will be allocated as operating capital. Why Invest in Culina? With Culina, investors have the opportunity to get in on the ground floor with a company that’s positioned to grow into a leading innovator in the home automation and IoT space. With Culina, we’ve tapped into something truly extraordinary that’s being celebrated by both early adopters and investors alike. With 10,000 units pre-sold and $1.89M in pre-launch revenue , we’ve already successfully demonstrated validation in the consumer space. With over $5 million in funding secured across several financing rounds, we’ve already proven that investors believe in our company, our mission, and our ability to succeed. We’ve also established a scalable business model and robust product pipeline that will prime us for widespread expansion in the days ahead. We’re now seeking investors who share our passion and commitment to pushing the boundaries of what home automation can be and do through nextgen technology. We’re looking forward to working with you in accelerating Culina’s growth to become a dominant player in the booming global home automation and IoT industry.